I really wanted to like Becoming Fearless: My Ongoing Journey of Learning to Trust God by Michelle Aguilar. Let me just go on the record first and admit I have never watched "The Biggest Loser". However, I don't think that affected my opinion of this book at all. 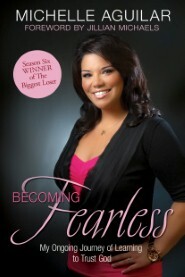 When I first started reading Becoming Fearless it seemed like a good book, but as I read on I grew confused. The way the book was written caused too much back tracking and trying to keep the events in order. Instead of answering my questions, it just left me wondering - things just didn't seem to fit. For example Michelle stated that she had stopped attending church, praying, and having a relationship with her mother, but then we find her at church with her mother. Also, it seemed to me that Michelle used her family being in ministry to justify her feelings of anger and shame, but we come to find out her parents stepped down from ministry many years before her parents divorced. It would seem pride was more the problem then fear. For a book that is supposed to help us become fearless and trust God, it doesn't seem very honest. I would describe it as shallow. It seemed to be more about Michelle finding her "voice" and getting rid of her "co-dependent" tendencies (psychological jargon) than about trusting God.